Like many of the hidden gems this city has to offer, Irie Palace (7506 W. Appleton Ave., 414-461-8203) is nestled unassumingly in a bastion of depressing chain restaurants, pharmacies, and megastores. Defy the standards of comfort mandated by Milwaukee’s sadly-segregated nature, however, and there is a massive payoff waiting for you in the form of this incredible authentic Jamaican restaurant. Putting it kindly, Irie Palace doesn’t look like much from the outside. Putting it frankly, the gnarly blue eyesore of a building where the restaurant resides contains three businesses; each one possessing a forgettable sign. 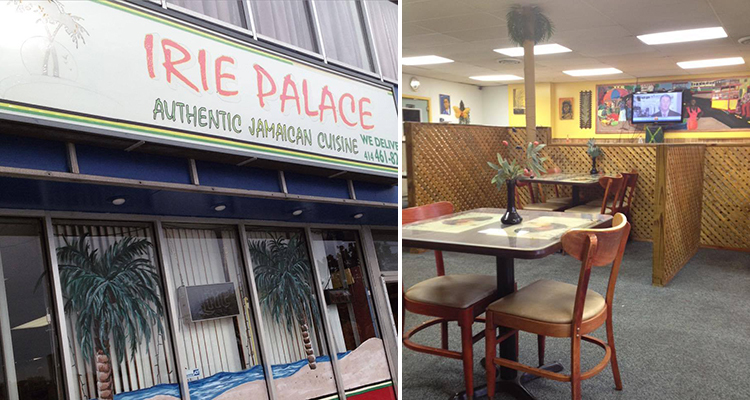 Sure Irie Palace’s sign has palm trees and says “Authentic Jamaican Cuisine” but if you’re like the vast majority of Milwaukee citizens and don’t know what that entails, your likely predisposition is to zoom by in search of easier parking and a more inviting exterior. Past the rough, however, there lies a diamond. The space: Entering Irie Palace on a blustery autumn day provides a refreshing divergence for anyone mourning the end of summer. Guests are welcomed by a big room painted with bright, warm colors and a charming-yet-corny (but not obnoxiously over the top) Caribbean theme. Even with the light touch of a theme, there was not too much that stood out, aesthetically speaking. One sad element of the restaurant’s ambiance is that it was evident that the employees of Irie Palace were used to an environment free of customers. Over the entire course of the meal, there was a radio and TV playing simultaneously and at a louder than necessary volume. The vibe upon entry was indeed warm and welcoming, albeit a bit clumsy on account of it feeling like we accidentally walked into someone’s living room who wasn’t expecting a guest. The service: Once the service found its rhythm, everything went as smoothly as could be. Our server was polite and happy to explain things your average non-Jamaican dude may not be super familiar. Additionally, Irie Palace’s owner came over twice to ensure we were happy with our food. Anything that could possibly be said about their service in terms of what we gleaned from our visit should be taken with a grain of salt. In the hour and a half that we were dining at Irie Palace, not a single customer as much as opened the door, so there was almost limitless room for error. Having said that, the service we did have was happy and accommodating. The food: Irie Palace’s menu is a bit confusing. The single page menu has one section bracketed off for standard (presumably every day) entrees. The category features some Jamaican standards like jerk chicken and cow foot with beans, both coming in at $8.99 for lunch or $10.99 for dinner. Then, there are these three other sections for Wednesday, Friday and Saturday specials. Not too confusing, right? Well, as it turns out, you can order any of these items any day, most of the time, which is information that may have been useful to know prior to ordering. No matter, though, as what was ordered was indescribably delicious. More often than not, chicken falls in to one of two categories. Bland and sad (baked, poorly seasoned lumps of semi-edible paleness) or dynamic and delicious (fried, roasted, General Tso’d etc.). Irie Palace’s jerk chicken defied every boring and unimaginative culinary cliché that’s been thrust upon the noble bird. Lively and complex flavors give way to a heat that’s intense but not overpowering. The oxtail stew is no pushover itself, with rich bites of on-the-bone oxtail that are almost floating in their own fat. As an additional perk, these already large portions come with a generous bowl of rice and beans, cabbage and caramelized plantains. Wash these down with one of the many Jamaican soft drinks you can pick from on the menu and you’re made in the faux-palm tree provided shade. If any downsides can be referenced, the list is short. First. the menu is aggressively non-vegetarian friendly. The staff is more than happy to whip up a little vegetable medley for anyone coming in who doesn’t eat meat, but it’s a pretty unremarkable affair. Secondly, the sides were less than compelling. Cabbage is cabbage and the rice and beans were a touch dry. This shouldn’t present itself as a big deal though, as the entree portions are sized to gorge. The verdict: Not only should Irie Palace be removed from the anonymity it’s been wasting away in, it should be made to thrive. Make Irie Palace a priority, and our recommendation is to do it sooner than later. As excellent a restaurant as Irie Palace is, nowhere can stay open long without customers. Make the trip, you’ll be happy you did.